Knowing the mower conditioner was working fine when put away last season is no reason to suggest all will be tip-top come first cut. Geoff Ashcroft sought some pre-season advice on checks and set-up from Kverneland’s Phil Difford. Winter does funny things to machinery and equipment. More so with seasonal kit which is unceremoniously dragged from the back of a barn and expected to perform right off the bat. A little time spent making visual checks, cleaning and freeing up ahead of greasing, checking and/or changing oils could pay dividends, as an avoidable breakdown is regrettable. 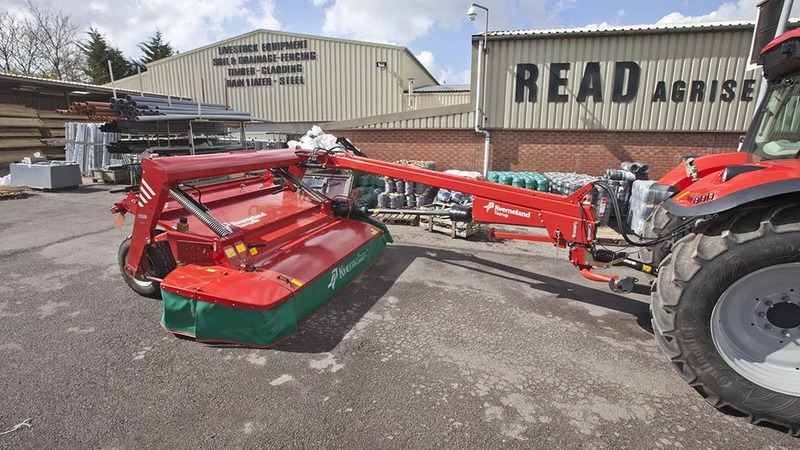 Using a trailed Kverneland 4332 mower conditioner as an example, many of the following pre-season checks can also be applied to other makes as well as rear- or front-mounted machines. 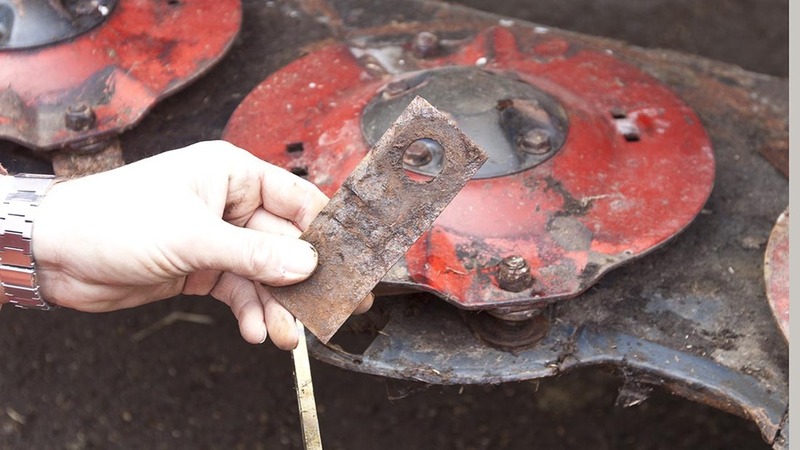 But before you even think about opening guards, apply the handbrake, chock the wheels if checking a trailed mower, and remove the tractor’s ignition key to prevent accidental start-up. 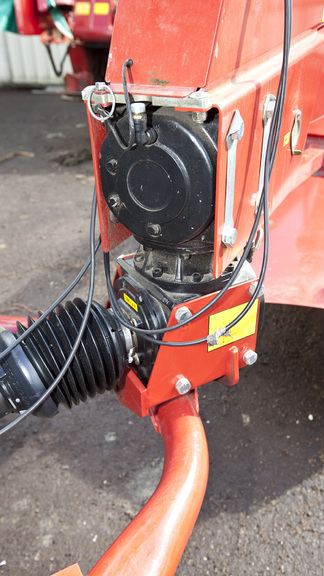 On this model, a short, telescopic driveshaft sits below the main gearbox and transmits power down to the mower bed. If the splines are seized, this can impact on how the bed suspension behaves, but is more likely to cause collateral damage to the main gearbox when the bed is lowered. If in doubt, remove the surrounding guards and withdraw the shaft to check for movement. Grease and refit. Remove the guard to gain access to the conditioner belts. Check for splits, cracking and signs of failure. Clean any debris from pulley Vs and refit the belts, making sure correct tension is applied. This model needs a pre-load on the belt tensioner, and is measured through spring height. 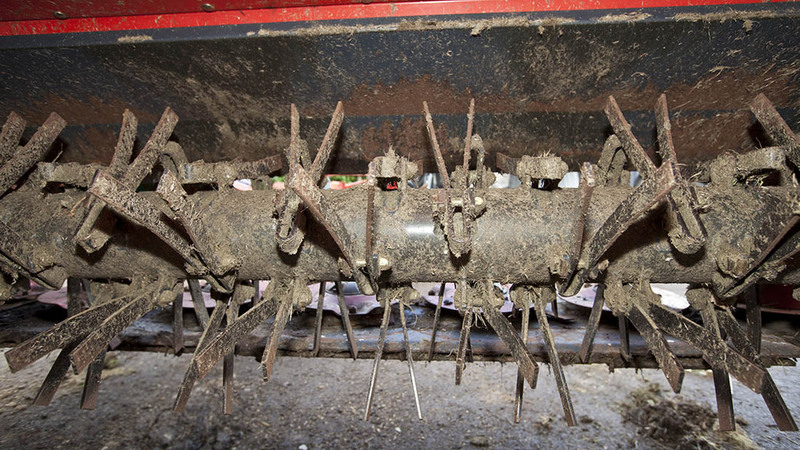 Check the conditioner for damaged or missing tines. 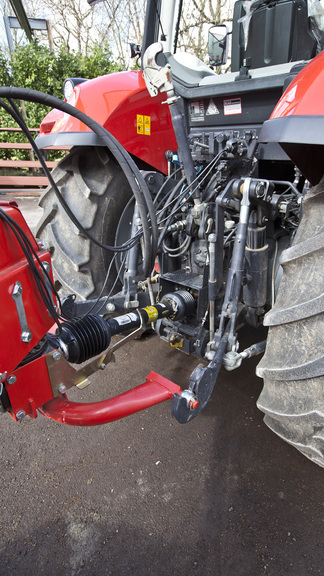 On this semi-swinging tine machine, ensure all tines are able to move. It is also worth putting spanners across nuts and bolts used to secure high-speed rotating parts, suggests Mr Difford. It would not take long for a loose nut to let a tine to go wayward and upset a forager’s digestion. Mower bed oil should be replaced each season, but at the very least the oil level needs checking. Methods vary from machine to machine, so a handbook makes essential reading. 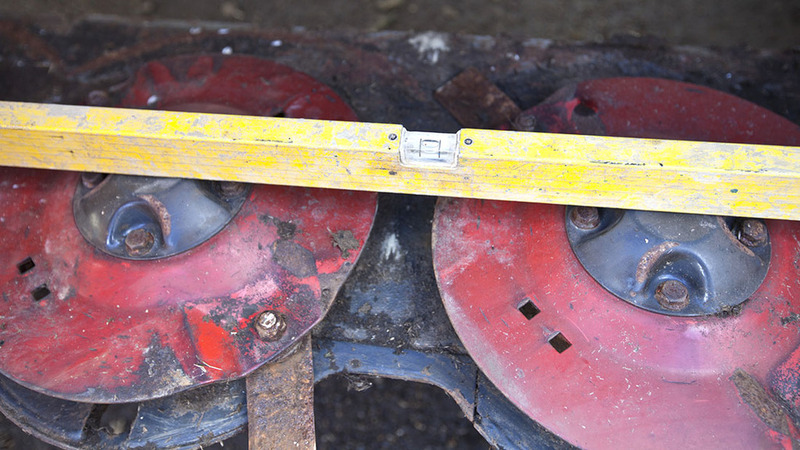 Oil level on this 4332’s bed is checked by dipping, but only after the bed has been positioned and checked using a spirit level to ensure the bed is perfectly horizontal from left to right and front to back. 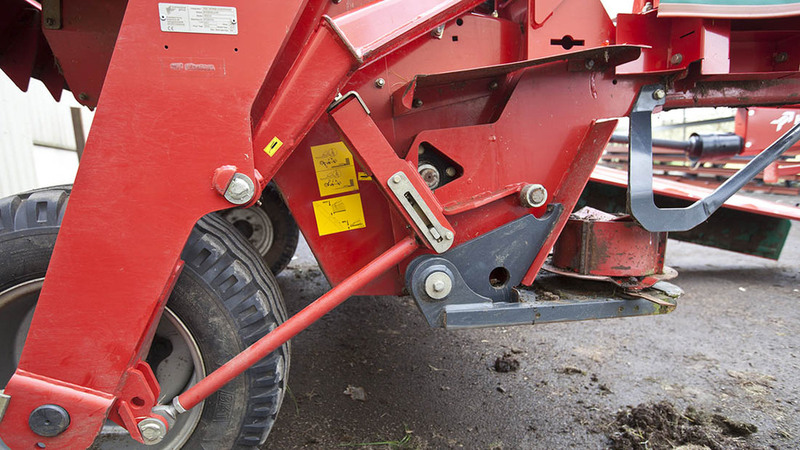 A visual check of hydraulic hoses, rams and seals will quickly identify areas which may soon be in need of attention. This pipework, despite being clad in a protective sheathing, has been trapped and needs re-routing before a breakdown occurs. It is the best way to avoid an in-season failure. 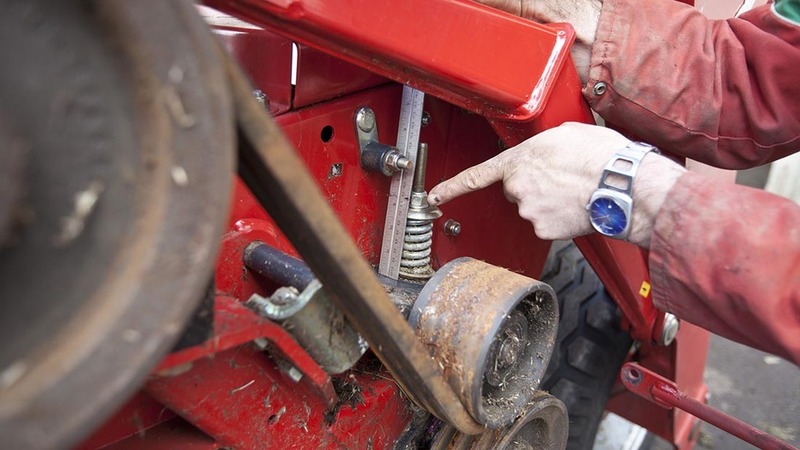 An often over-looked area to check is tractor lift arm height and tyre pressures, especially for mounted mowers. 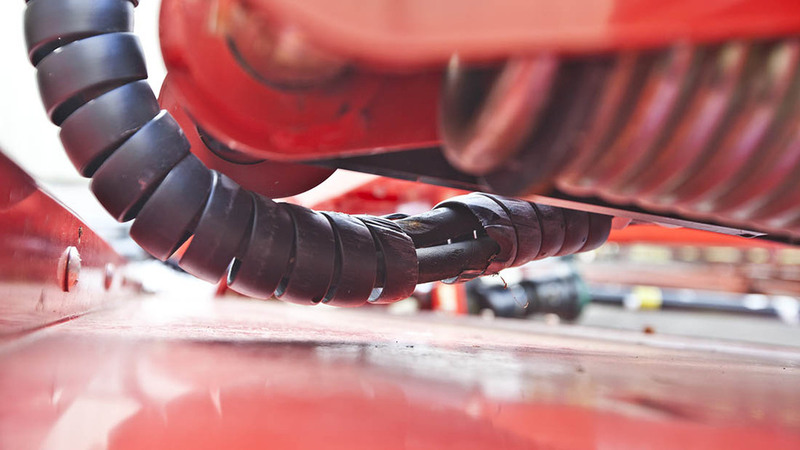 While the effects of uneven measurement are more easily masked with trailed kit carried on the lower links, the problem is more pronounced on mounted mower conditioners. Measure lift rod lengths and tyres pressures, ensuring both sides are identical. And do not forget to check tyre pressures on a trailed mower conditioners. Headstock gearboxes, like any other gearboxes, need checking for signs of oil leaks, with repairs carried out as required. Consult the operator’s handbook for correct oil type and level checks – a pre-season oil change could be good preventative maintenance, and if the oil contains foreign objects, you will need to look further. The powertrain, pto guards, pto tubes and any overload protection devices also need to be checked and reset according to the handbook, with damaged components being replaced. Do not over-grease bearings and joints, but follow manufacturer’s guidelines. Cutting height and blade pitch on this model is set and adjusted by altering the location of the tie-bar which joins the bed and rear axle. For most mounted machines, the top link does the job. Determine the desired stubble height and set according to the manufacturer’s instructions and/or the field conditions. As a guideline, bed angle should be less than 10 degrees to the ground. Apply oil and then a spanner on the bed’s spring adjusters and check they are easy to move. Rough set-up should allow you to manually lift a corner with a bit of effort. Though you may need to tweak the settings when out in the field. With trailed mower condioners Mr Difford also suggests setting the nearside spring slightly heavier than the offside. Doing so will help the nearside of the bed to resist lifting slightly from a torque reaction. This phenomenon can occur each time the tractor changes gear, and this can cause the stubble height to vary. It is also important to check break-back mechanisms are not locked soild on mounted machines. Even if you are not going to change blades – and you really should – at least remove them all and refit. This serves two purposes – it allows you to check for cracking around bolt holes and it also lets you replace or free-up any stuck blades. Blades on the far-right disc do more work than any others, as they cut against the next bout in addition to grass ahead of the disc. And working against the headland, these blades are subjected to the worst of field conditions. So make sure all is as good as it should be. Also check the condition of the skids and the filler plates between the discs, replacing any that are badly worn or missing.